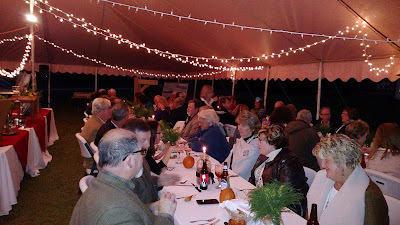 After months and months of planning and preparing, it was finally time for the Harvest Farm-To-Table Dinner hosted by the Kershaw County Farmers Market, so on a cool and breezy night in mid-October, the event started to unfold. What a spectacular sight it was to see! A huge tent was set up on the lawn in front of the Kershaw-Cornwallis House, and people were scurrying around putting the final touches in place. 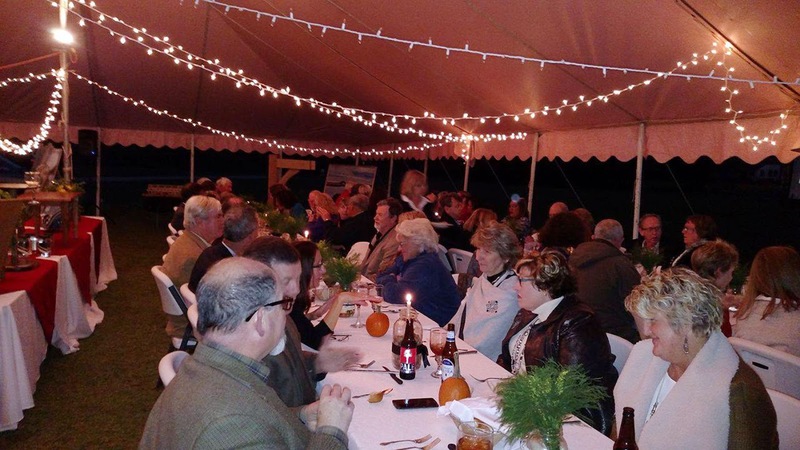 The dinner was a fund-raiser to help construct a a permanent pavilion at the Kershaw County Farmers Market, a long sought after dream and vision of the market Board of Directors, as a way of establishing roots so they can grow in Kershaw County. This pavilion will be made from as many local resources as possible, and the committee has partnered with the Timber Framer’s Guild to have a true barn raising for this building. How fantastic is that? Naturally I was thrilled when I was invited to attend the dinner. As a long-time customer and volunteer for the Kershaw County Farmers Market, spearheading their social media advertising, an avid "foodie," and small family farms advocate, this was an event I was really looking forward to ... and it did not disappoint. Oh my goodness, it was spectacular! Chef Trent Langston, and his crew from Lilfred's Restaurant and Creative Catering, in Rembert, SC did an amazing job with all the locally sourced products. Everything from the leg of lamb from Old McCaskills Farm to the pork loin from Fort Farms, the Brussels sprouts and carrots from Camden City Market, to the SC wild-caught shrimp from Off the Hook Seafood, Boykin Mill grits, and the Carolina Plantation Rice Carolina Gold Rice was expertly prepared. The bread basket full of freshly baked rolls from Mulberry Market Bake Shop was delicious served with some Happy Cow Creamery butter and Bell Honey Company raw local honey and the Kings bean coffee from Books on Broad was much appreciated with dessert at the end of the dinner. The food, the table settings and the crowd all made it a night to remember! The silent and live auctions were also a big hit, with lots of bids coming from the crowd. As all good things must come to and end, it was soon time to leave and head home. It was a GREAT night supporting local! As a small family farms advocate, it was a fantastic experience for me, and one I won't soon forget. We all need to know where our food comes from, do our best to support local farms and farmers markets, and thank a farmer today! Looks like an awesome night to remember celebrating the Farm-To-Table Movement! Looks like a lovely event. Great post Mary!! Thank you Julia's Simply Southern! Everything looks and sounds wonderful! So happy about the pavilion and very happy you were an attendee! Thanks so much Nikki! I was thrilled to attend, and yes, the pavilion is going to be fantastic.